WOW, the momentum is not slowing down in BWA Auction. After yesterday’s holiday Day 4 of BWA Auction saw 8 rounds of bidding today with 24 rounds completed overall. The Pan-India license rose by 1085 to touch 5270 crore rupees. Comparatively, BWA has easily surpassed 3G auction Day 4 pricing. Within 4 days of auctioning, the Pan-India licensing price has now reached 3 times the expected base price. Exchequer will be thrilled with the Moolah it is going to make from Private Telecom Operators. In case of BWA Auction, Exchequer is now set to earn 10,541 crore rupees from private telecom operators for 2 slots of BWA spectrum that are on Sale. In addition, BSNL & MTNL who have been allotted a spectrum each in their circle will pay an equivalent bid amount to the Government. 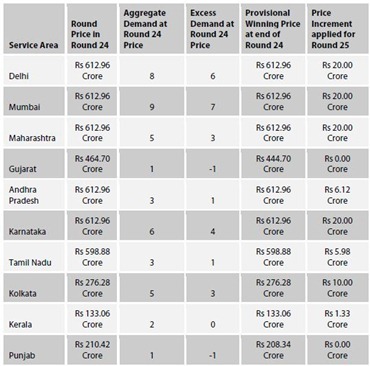 Delhi and Mumbai are being bid feverishly, with both the circle bids reaching 612.96 Crore, and still there is an excess demand – 7 for Mumbai & 6 for Delhi. Maharashtra, Andra Pradesh and Karnataka are also currently bid at 612.96 crore with excess demand of 3,1 and 4 respectively. It is a contrasting picture if you consider bids for all the 22 circles, while top 6 circles are getting astronomically high bids and excess demand, the other circles are already showing negative demand. Out of 22 circles, 13 are now showing negative demand (Gujarat, Punjab, U.P(east), Haryana, Rajasthan, M.P, West Bengal, Himachal, Bihar, Orissa, Assam, North-East and J&K). Surprisingly even Gujarat is one of the states which has no further takers even though its bid has reached respectable 465 crore. UP (West) & Kerala had neutral demand. 11 circles have not even crossed 100 crore with 6 of them bid below 17 crore. I think one of the reasons why we are seeing such hectic pace at the top is – Telecom Operators seem to now have complete hang of the auction process after 3G auction was dragged to more than a month. I hope we see a quick close on this BWA Auction. Finance Friday: India’s first ever IDR from Standard Chartered gets lukewarm response – subscribed 1.38 times ! After 3G, Will Broadband Auction Pop-up Surprises?